The technique is actually pretty straight forward, but you will need the following materials. 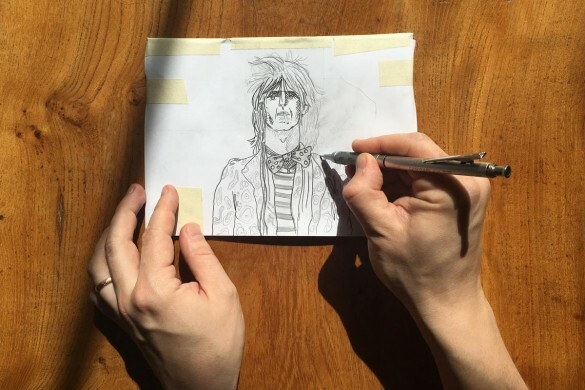 You’re beautiful lino print idea, inks, roller, a pencil, plain newsprint or layout paper, tracing paper, some masking tape and baren/wooden spoon or press. I am going to show you the technique using a simple little leaf design I carved one Sunday morning over a cup of coffee. Your design can have lots of layers of colour, but until you’ve tried the technique a few times I’d recommend you start with a simple two colour layer design. My example uses a keyline layer – with all the leaf details, and a solid block colour layer for the area of my leaf. There are some great effects you can generate by layering colours over the top of each other, and if you are feeling daring then you can weigh in straight away with experimenting with those techniques. For my leaf design I needed to create a second block that would act as the area for the colour of the leaf. Your design might have just two layers like mine, or multiple layers. You can have as many as you like, but for simplicity I’ve limited this to just two for my lino print. 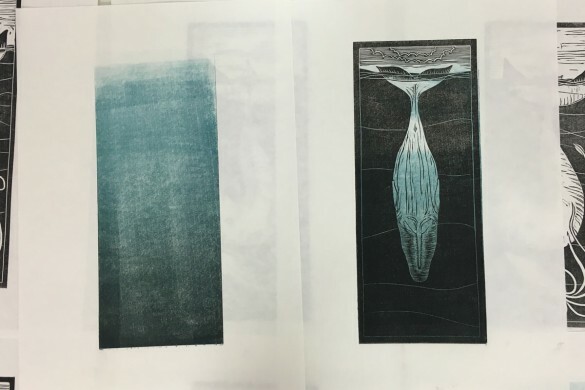 I need my second layer to exactly fit with my first, so you transfer the design from the first lino block to a second one. To do this, start by taping a sheet of tracing paper onto a plain sheet of newsprint or layout paper and ink up the first lino you’ve carved. Lift up the tracing paper and place your inked lino facing upwards on the plain paper so that it will be directly underneath the tracing paper when you lay that back down. 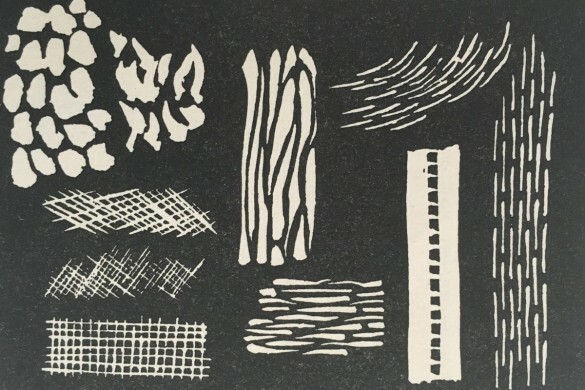 You are going to transfer the ink from the block to the underside of the tracing paper and then transfer the residual ink from the tracing paper onto a new piece of lino. 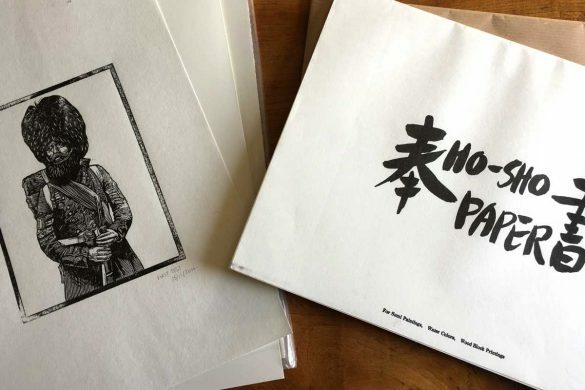 When the tracing paper is laying on top of the inked lino use a baren or a wooden spoon to gently press the ink onto the underside of the tracing paper. When you feel confident you have transferred enough ink across, carefully lift up the tracing paper and replace the inked lino block with a fresh piece of lino. Try and place the new lino in a position where it will be beneath the ink on the tracing paper when you lay that back down. When you’re satisfied you’ve got it roughly lined up lay the tracing paper down over the lino. 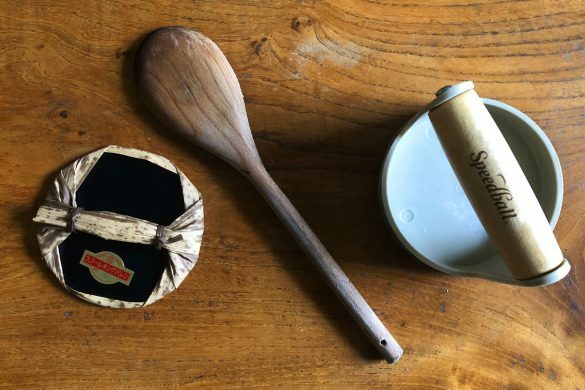 Use a baren or your trusty wooden spoon again and really press down on the tracing paper layer, you want to ensure that you transfer as much ink as possible onto the fresh lino at this stage. OK, now peel back the tracing paper and you should have an imprint of your designs first layer on the new lino block. 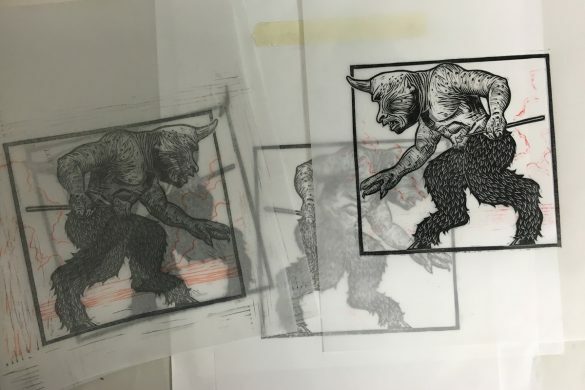 The reason you transfer the design this way is because you do not want a mirrored version of your first layer, which is what you would get if you just printed the lino directly from one to the other. Use the transferred design as a template to guide you when choosing areas you want for your second colour. On my design I decided to have one solid area for the leaf and a layer on top that defined the veins, stem and edges of the leaf. This is the stage where you really make the magic happen, so get ready. You need a new piece of plain newsprint or layout paper, larger than the size or paper you intend to eventually print on. Place a piece of paper that is the size you are going to print onto on the sheet of newsprint and draw around it. 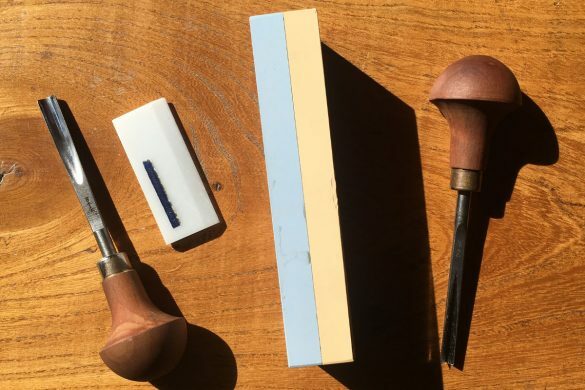 This will help work out where you want the layers of your design to be placed on the final lino print and it will mean you can accurately line up your paper when you come to print later. Next, position your first layer of lino (I decided to use the layer that had the keylines on it) onto the template and use the edges of the paper you just drew around to position your design where you want it to be on your final print. I decided to place my design bang in the middle. When you are happy draw around the layer of lino. OK, so you’ve started to get the template ready, but now you need to get the second block added and you want it to be placed accurately so the layers all line up on your print. 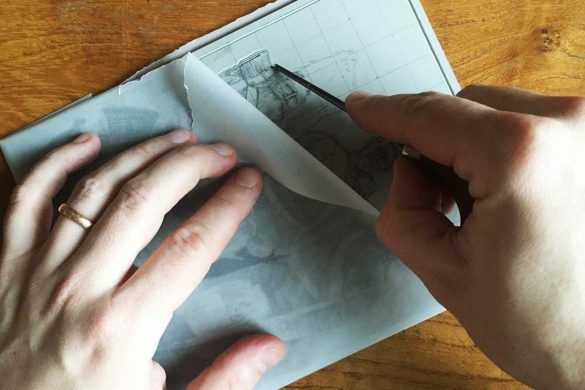 To do this you need to tape another piece of tracing paper onto your template sheet, when that is done roll some more ink onto your first block. We are going to repeat what we did earlier as this will help with lining up the second (and potentially third, fourth and fifth) block for your template. I also scribble top and bottom on my template so I don’t forget the orientation of my template if I need to go away and make a sandwich or something. Place your inked block on your template using the lines you drew around it on your template to line it up like a master. Then place the tracing paper down over the top and carefully transfer the design to the underside of the tracing paper. When that is done peel back the tracing paper and remove the lino. Don’t untape the tracing paper, it’s important that that doesn’t move. Next, ink up your second block. I decided to mix up a nice pastel green. Now slide the new layer in place under the tracing paper. Use the ink from the first block you transferred to help you line up the layers. When you are happy you’ve got it all nicely lined up draw around the edge of the second linocut block. Badda-bing! 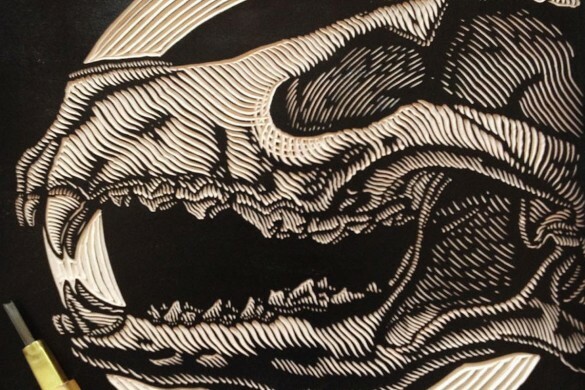 You now have your amazing colour lino printing registration template. You are practically a professional printer now! You are going to use this to make sure all your different colour layers line up. You can experiment with how colours mix when you layer them on top of each other, and it’s fun to play around with tones of colours and the variances you can achieve when mixing extender ink and opaque white, which I’ll write a blog about another day. 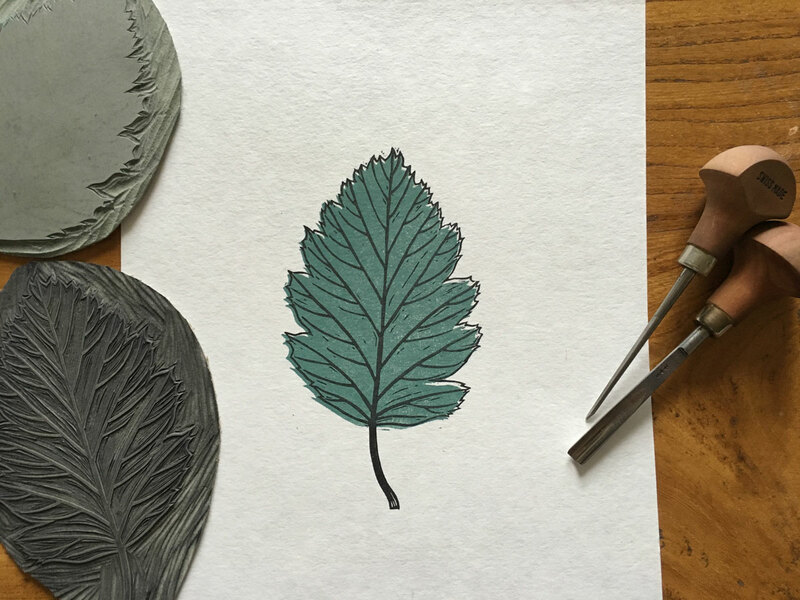 For this blog I’m keeping things simple, and the first layer I’m going to print is the background green layer for my leaf. Roll on your ink nice and evenly to the block you want to print as your first layer and then carefully line it up using your professional printing colour registration template and steady hands. When you’ve got that in place, carefully place the piece of paper you are going to print on over the top. Use the lines of the paper edge on the template to make sure you get it lined up accurately. I line up one edge and a corner, and then keeping the pressure on one edge I let the paper fall lightly over the block and the template. I use a book press when I’m printing at home, so I have two pieces of wood that I sandwich the template, block and paper between. 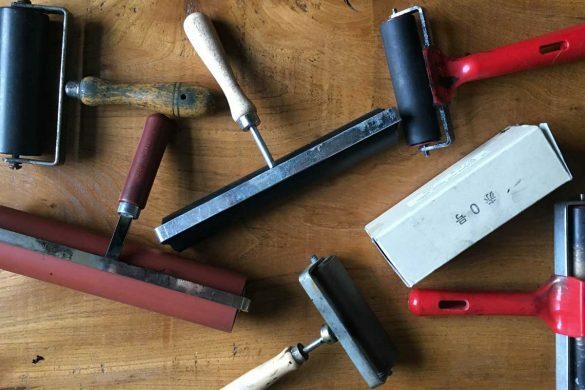 You might use a baren, wooden spoon or a fancy pants etching press, but the key here is to not let the paper or the lino cut slide about as this will mis-align your final print. Once you’ve pressed and peeled back the paper you will have your first layer. At this stage you should print as many of these as you want and then let them dry on a drying rack, or like me you can spread them out across your flat in multiple places and hope that the dog doesn’t walk on them. Now go and make a cup of tea and eat a biscuit. Once the first layer of ink has dried (or is nearly dry) you can mix up your next colour and roll that onto your next block. Roller a nice even layer of ink onto the lino and then again use your registration template to get the lino block lined up. And ta-daa! 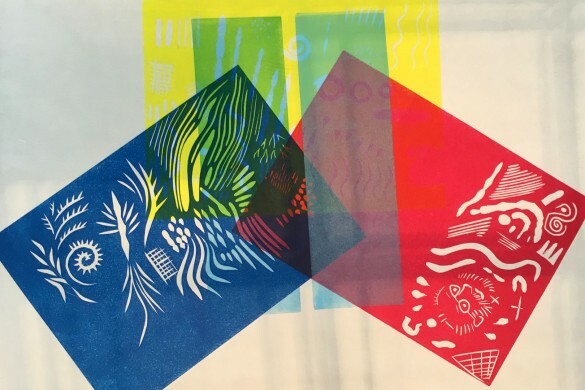 You have a fantastic colour lino print with multiple layers! My leaf didn’t quite line up perfectly, but I quite like the slight mis-registration I ended up with. I think that sometimes the perfection of this artform is actually in the imperfections. 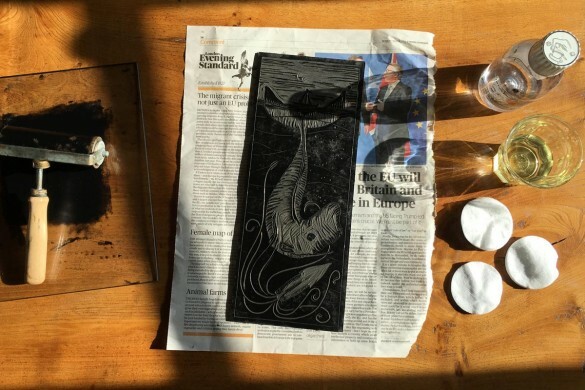 I’m sure that your colour lino prints will look amazing, and with practice you’ll master this technique and have hours of lino printing fun. 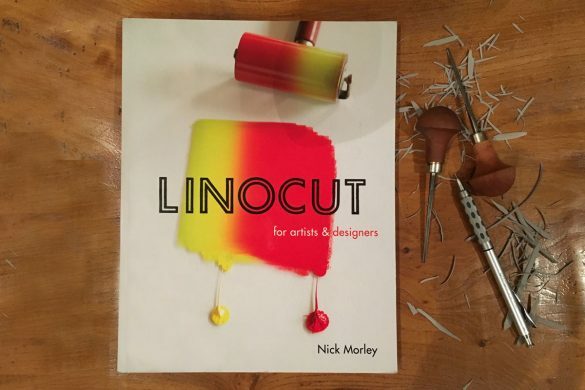 I want to say thanks again to Nick Morely, aka Linocut Boy for showing me this technique for colour lino printing. What a gent! This is such a great idea! Thanks for sharing. Definitely going to try this on my next multi colour print. Brilliant! Its late and I’m tired, so I thought I’d struggle to understand and have to bookmark this article to read later, but your instructions are so clear! You’ve changed the way I will work in the future. Thank you. And I LOVE the leaf print. The misalignment works perfectly. Thank you, very helpful, vast improvement in my dodgy registration! Excellent tutorial. Thank you for sharing/teaching this technique. This is wonderful! Super helpful! Thank you for sharing and in such detail! 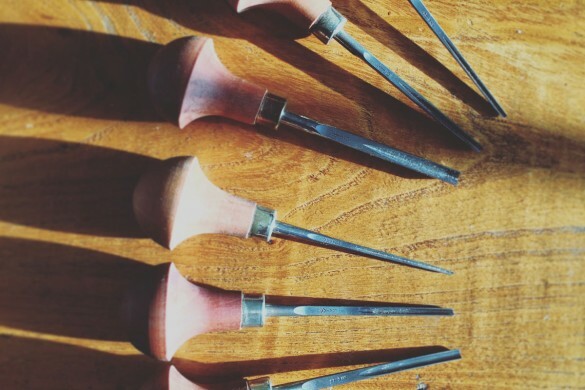 Thank you so much for having such a useful blog about lino printing! Every time I search for something I’m stuck on you appear and help me out. This method is really close to how I line up my screen prints (only I use acetate and wipe it down later). Definitely trying this tomorrow!